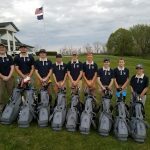 The FCHS golf team just completed their 3rd match of the year. They are competing in style thanks to the Franklin County Athletic Boosters. FCAB purchased 10 golf bags for the team to use this year and beyond. Thank you to the hard work of all those involved in helping our teams achieve their goals.